On a roll or in a rut? I'm not sure. So here is the third top, and the fourth won't take me long. One of these days I will get round to quilting them. I'm just not sure how soon, because we have just started an Indian summer, which is infinitely more pleasant than the actual summer, which quite frankly I was glad to see the end of. I am finally getting the gardening done, and am inclined to leave sewing until the next time it rains. Which leads to my next quandary. Doing all this easy piecing has kick-started my imagination. 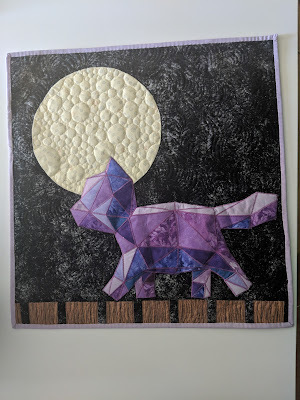 The annual 12 x 12 exhibition at Midsomer Quilting is fast approaching, and I haven't started anything yet because I couldn't think up a project for this year's challenge, which is "Think of a Number." I have had since last December to come up with an idea, and didn't have anything approaching a brainwave until last week while waiting for a bus. Then this morning the brain decided to overburden me with a second flash of inspiration. Serves me right for mulling it over at a bus stop and letting the idea think it was a bus. Nothing for months, then two in a matter of days. Can I finish two mini quilts in six weeks? Or shall I be an adolescent about it and not even bother? It all depends on the weather. Grey wagtails are usually fairly timid, and fly off before I manage to get the camera out. This one, however, was plainly used to people. I snapped him last month dabbling in the river at Glendalough, where we took a day trip while we were staying with our son and daughter in law in County Wicklow. For Sunday best or visits only - this little cardigan will fit a baby boy once he is crawling and toddling. In other words he will get it grubby in no time. Navy blue would have been far more practical, but this is what I had in the wool stash, so pale blue it is. I don't think I will ever stop loving random yarn. It keeps you knitting until way past bedtime. For the raglan shoulder shaping I tried a different method of decreasing from previous cardigans knitted in the same stitch. Sooner or later I shall decide which method I like best and stick to it. This is one of the reasons that I knit so many little cardies, so I can try out different stitches and keep ideas in reserve for bigger projects. Of course, there is the element of fun. I couldn't resist these spotty buttons. Oh the joy of piecing! I have been playing with all the pretty floral prints that I pulled out last week and so far I have made tops for two cradle quilts. Once I have made three, or even four, then I shall have a quilting blitz. It adds to the excitement if you can finish several items in quick succession. 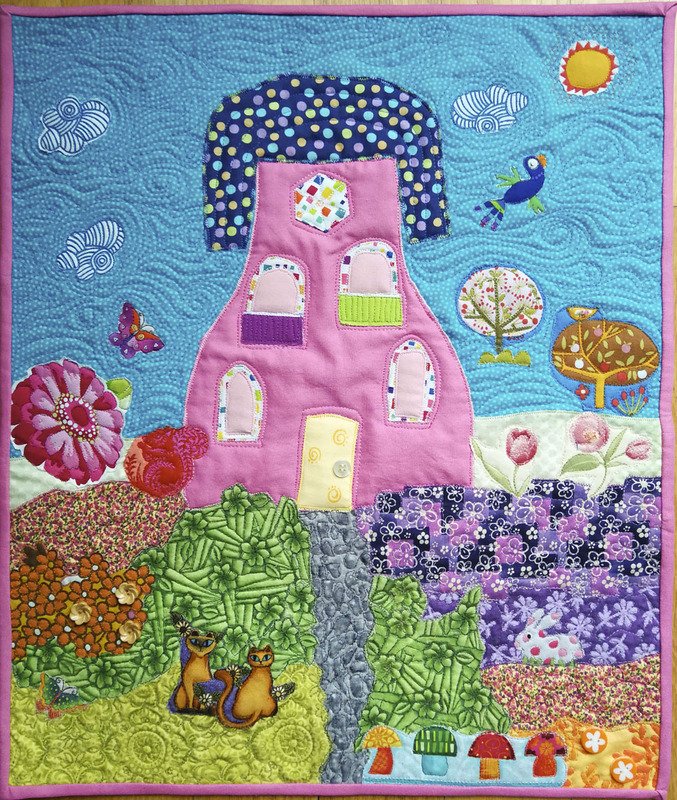 … and this one has a pink border and will be bound with blue. 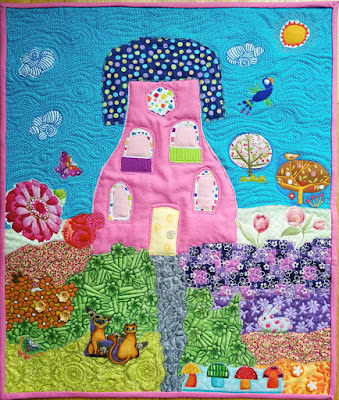 The pink quilt will have a roses theme. I have been intending to make a girly pink roses quilt for ages. There is a very real risk that I shall be reduced to a heap of mush over my sewing machine while working on it. Red is everywhere in the hedges at the moment now that the hawthorns are covered in berries. Seeing the beautiful green hops took me by surprise. Shame my husband doesn't make beer any more.